ATLANTA, December 19, 2018	(Newswire.com) - How many people have found themselves in a drug store or gas station desperate to find a last-minute gift? Now, what consumers may not realize is that sometimes waiting until the last minute can actually save plenty of money. 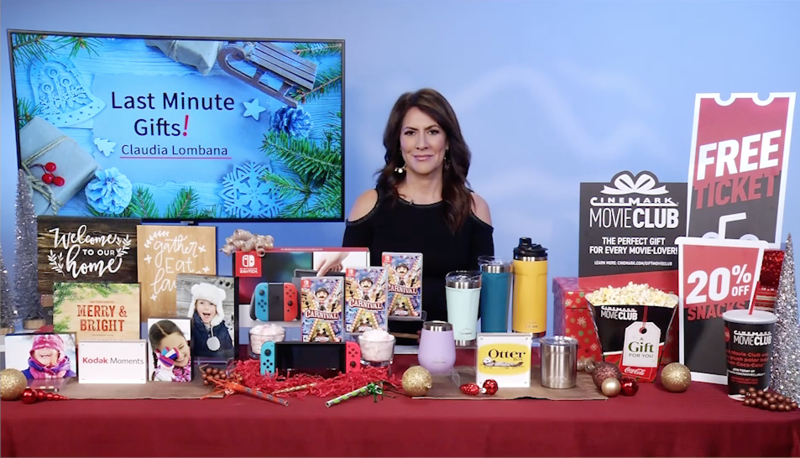 Emmy and Peabody-Award winning journalist Claudia Lombana shares some of her super last-minute shopping secrets. One great way to create holiday memories is playing games on Christmas morning, like Carnival Games. Carnival Games is the perfect family-friendly game for anyone, anywhere, now for the first time on Nintendo Switch! Like a real-life county fair, Carnival Games bursts with exciting games that you can play over and over. With both fan-favorite and brand new mini-games all in one package, Carnival Games on Nintendo Switch can be played alone or with up to three others. Hit home runs, pile the highest stack of cakes, and take your horse to the finish line, 20 total mini-games will have family and friends stepping right up to win again and again! Carnival Games on Nintendo Switch brings the party back for the entire family. For more information, visit www.nintendo.com/games/detail/carnival-games-switch. It is never too late for a really special gift. A great way to do this is to create personalized photos and décor panels at CVS, and it only takes minutes. With Kodak Moments you can make a one-of-a-kind gift without a lot of effort. Available in 4×6, 6×8, and 8×10 sizes, starting at only $5.99. Display a favorite memory on a free-standing photo panel or create customized décor panels; there are many designs available and ready to gift. All you need is a bow! Visit a CVS store and head to the Kodak Picture kiosk, or order online or at home by visiting cvsphoto.com to make the perfect gift today. Do not stress out looking for a gift, because Cinemark Movie Club is now available for gifting to family and friends! Everyone loves a little movie magic, and Cinemark Movie Club can be sent as a gift in increments of one month to a full year at www.cinemark.com/giftmovieclub. The perfect gift, the Cinemark Movie Club membership includes one movie ticket per month with a rollover feature, a 20 percent concession discount every visit, waived online fees, and member pricing on companion tickets. See all the holiday blockbuster movies like Spiderman, Mary Poppins and Aquaman. A Movie Club membership is the perfect gift for the movie-lover in your life; no shipping, wrapping, or long lines! The tough and versatile Elevation Tumblers from OtterBox are the perfect gifts for everyone this holiday season. There is something for everyone because Elevation lids can be swapped to transform drinkware from morning coffee to hydrating water bottle to cocktail shaker and more. Elevation Tumblers are available in different size and color options, including wine tumblers, perfect to use as stocking stuffers. For more information, visit www.otterbox.com/en-us/tumblers.